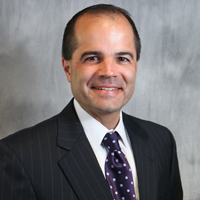 David Hernandez is executive vice president and chief strategy officer for Hunt Consolidated, Inc. He was previously senior vice president and general counsel for HCI. Before joining Hunt, he was vice president of tax for EDS. Prior to EDS, Hernandez was in private law practice with the law firms Hughes & Luce, LLP, and Vinson & Elkins, LLP, in Dallas. Hernandez has testified before the Senate Finance Committee on the competitive importance of the U.S. Research and Development Tax Credit. Hernandez previously served on the Board of Directors and chaired the Human Capital Committee of Strategic Growth Bank, Inc. He has previously served as a member of the board of directors of The Tax Council and has served as the International Chair of the Texas Bar Association Tax Section. He served for three years on the Planning Committee for the Tax Council Policy Institute in Washington, D.C. In 2016, Hernandez received the Robert H. Dedman Award for Ethics and Law from the Dallas-Fort Worth Chapter of the General Counsel Forum. He holds a J.D. degree from The University of Chicago and a bachelor of science degree in finance from The University of Virginia, McIntire School of Commerce.